A unique shot of a total lunar eclipse on Aug. 28, 2007, looks like a giant cotton swab hovering over the profile of Mingus Mountain in Arizona's Prescott National Forest. During a total lunar eclipse on Aug. 28, 2007, astrophotographer Donna Chesler captured this unusual time-lapse image of what looks like a giant cotton swab looming over Mingus Mountain in Arizona's Prescott National Forest. Chesler created this optical illusion by capturing a 3.5-hour-long exposure of the moon as it passed through Earth's shadow in what's known as a "blood moon" lunar eclipse. 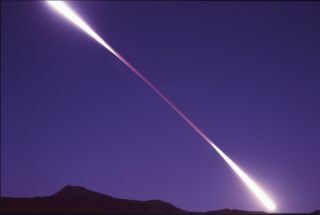 She captured the image early in the morning from a west-facing deck in Clarkdale, Arizona. "I cannot imagine that I will ever take a more perfect and intriguing picture," Chesler told Space.com in an email. "The beauty of this shot to me is that not only is there perfect composition, but also the sense of place, with Mingus Mountain on the horizon [creating] a photo that transcends the ordinary celestial photography." To capture the stunning lunar eclipse image, Chesler used a 35mm Nikon camera with a wide-angle lens and 200-speed slide film. Editor's note: There's another total lunar eclipse coming to the U.S. on Jan. 31! If you capture any amazing photos of this "Super Blue Blood Moon" eclipse that you'd like to share with us and our news partners for a possible story or image gallery, please contact managing editor Tariq Malik at spacephotos@space.com.